Because your customers are online. Everyday, more people are turning the the internet as their first source of information for local products and services. Especially younger, better educated consumers. They will only look in the Yellow Pages or in a newspaper if they can't find what they're looking for online. And they are likely to think your business or organization is "behind the times" (or even out of business) if they can't find you online. Your competition down the street has a website. Or if not, they soon will. When their potential customers call for more information, the competition can say "go to our website at ourbusiness.com for directions to the store," while you're struggling to give directions over the phone, or asking them to try to find that expensive Yellow Pages ad. Your website will work for you 24/7, 365 days per year. Your website will be a tireless worker. It will tell customers about your products and services, your business hours, give directions, and even show them full color photos of your products and your business. By including photos of yourself and your staff, your customers will feel like they have already met you before entering your door. It is very effective advertising. Unlike printed material, a website is 'alive.' It is dynamic. It interacts with your customer. It is available to everyone who works in front of a computer every day, and every person who surf's the internet for pleasure at home. It's reach is greater than any print ad, radio or television spot. A website is relatively inexpensive. Compared to newspaper ads, brochures, and the Yellow Pages, the web can't be beat for cost-effectiveness. A domain name (your .com name) can be bought for less than $11 per year, and the cost of professionally hosting a website is coming down all the time. 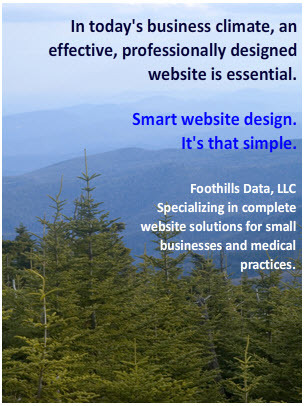 Finding someone to put it all together, and design, develop, and manage an attractive, effective website can get expensive - but that's where Foothills Data comes in. We are dedicated to providing superior value and affordable websites for our small business partners. It showcases your products and services. By offering pictures of your products, services, or your business location, you are pre-selling the customer. The old adage 'a picture is worth a thousand words' couldn't be more true in the internet age. Quite often your products can be presented in a more attractive manner with color photos than they can in your store or office itself, giving your customer a very positive first impression. Your website will give directions to your store or office. Not just give directions, but provide your customers and clients with a full color map, even turn-by-turn driving directions. Of course you also want to display your address, and maybe even a picture of your building. By having this simple page on your site, customers can find your location quickly and easily. It communicates with your customers and gets their feedback. Your website can effectively gather feedback regarding your products and services. It can help you improve your product line and tailor your services to increase your overall customer base. Gathering feedback will also make you aware of what your customers need and expect from your business. Your site can educate your customers. You can answer many of the questions you get most often with a Frequently Asked Questions page. You can also provide links to other websites to help the customer learn more about the kind of products or services that you offer. For example, a medical practice can provide links to important topics at WebMD.com.